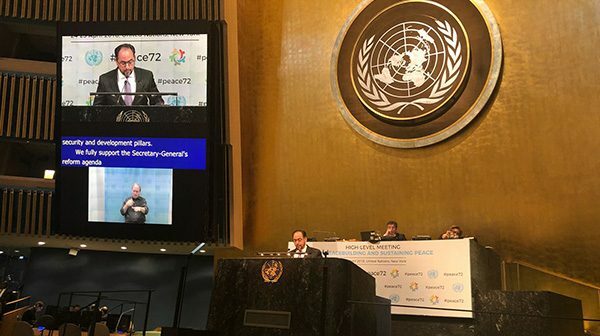 It is an honor to address this Assembly at this High-level gathering for a comprehensive UN approach to achieve a more peaceful world-order, based on the Sustaining Peace agenda. This vision has taken shape, in response to the evolving nature of challenges that face international peace and security. Addressing these challenges demands a more cohesive approach, better suited to advance peace-building from a more holistic perspective. The new approach correctly focuses on preventing the outbreak, exacerbation, continuation and recurrence of conflict; as well as addressing their fundamental drivers and root causes. It also highlights the imperative of a more effective development agenda to advance prosperous societies, grounded in the rule of law. In our view, the success of the “sustaining peace agenda” depends on several factors. As a foundational element, States have the responsibility to respect and adhere to the core-tenets of UN Charter for a rules-based international order. At times the causes of conflict are distinct, but instability and violence are most common in situations where international norms are violated. Non-compliance of international law undermines sustainable peace, while compliance and its enforcement help to maintain and bolster peace. For the UN to be more efficient, adequate adjustments within the system are essential for optimal output across the peace, security and development pillars. We fully support the Secretary General’s reform agenda, and welcome ongoing progress in that endeavor. 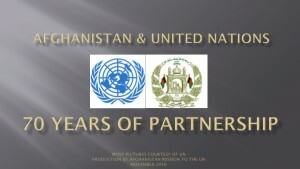 Afghanistan has been a key focus in the agenda of the United Nations. Since 2001, we have witnessed the emergence of a democratic Afghanistan, with viable institutions, and a vibrant civil society led by our talented and committed youth. Despite security challenges, the National Unity Government is consolidating these gains, with a goal of achieving Self-Reliance. We can say from experience, that international engagement in conflict or post-conflict settings should endure, until the fundamental factors of instability are resolved, and the situation is fully stabilized. This will consolidate peace gains and leave minimal space for a relapse to violence and conflict. The proliferation of new conflicts and deterioration of old ones has led to a more fragile international landscape. It shows that measures are needed to correct shortcomings in the area of prevention and root causes of conflict. While the nature of conflicts sometimes varies, terrorism and violent extremism remain a common security threat in many such situations. 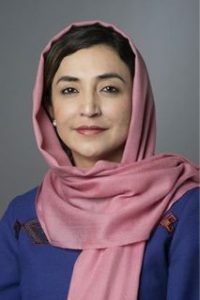 Afghanistan is engaged in the simultaneous task of fostering peace, while also combating a vicious network of terrorist groups, supported in the region, which operate to keep Afghanistan off-balance and disrupt our stability. Decisive action is needed to combat all forms and shades of terrorism, without any distinction. The establishment of the UN Office on Counter-Terrorism is an important development, in the context of UN reform. We hope it triggers new levels and modes of cooperation with member-states, especially those most affected by terrorism. The overall focus should be ensuring timely and proper action in honoring counter-terrorism obligations – under the UN Global Counter-Terrorism Strategy. In the area of prevention, more needs to be done to detect and resolve triggers before they lead to an outbreak of conflict. Moreover, the UN’s response should adjust to diverse conflict situations – be they internal, regional or international in character. Proper attention must also be given to the imperative of eradicating poverty; generating economic opportunities and embedding a culture of respect for the rule of law. The reform proposals for the UN Development System can avoid duplication of efforts and establish clear parameters for division of labor. We believe the design and delivery of development assistance must adjust to evolving situations and new ground realities, as countries consolidate institutions and designate development goals. We know that adherence to the principle of “national ownership” directly impacts optimal effect of development aid. 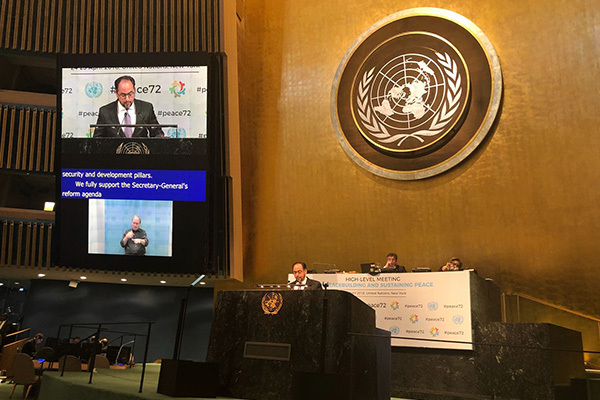 Afghanistan has also been a strong advocate of the ONE-UN approach, which has gained new focus in the context of the UN’s activities in our country. Afghanistan is well aware of the complexities associated with the task of peace-building. This challenging but noble endeavor is never void of obstacles and setbacks along the way. We can attest that with strong political will, national consensus and international support for peace efforts, success is possible. Under the Kabul Process for Peace and Security, we have spearheaded new momentum in our Afghan-led peace efforts for a political settlement to the current conflict. The peace offer made by President Ghani in February offers new incentives. It also incorporates the principles of national ownership and inclusivity, especially the proactive role of women in all stages of the process, including decision-making. We are also benefiting from contributions of civil society and religious figures in the process. This embodies the “whole of society approach,” highlighted in the General Assembly and Security Council resolutions. We urge all stakeholders, including regional countries to contribute to our Afghan-led peace process to help generate an enabling environment for direct and result-oriented talks. In conclusion, the commitments we make in this Conference will provide the foundation for a more effective international framework for sustaining peace. We must strive to uphold uniform principles and norms governing international law; and strengthen and expand new partnerships in support of a more effective and coherent UN approach. Indeed, doing so will certainly help ensure a just and lasting peace that holds and endures for all of humanity.